This is the circuit diagram of a very sensitive electromagnetic field sensor which can sense electromagnetic field from 40Hz to 140Hz. 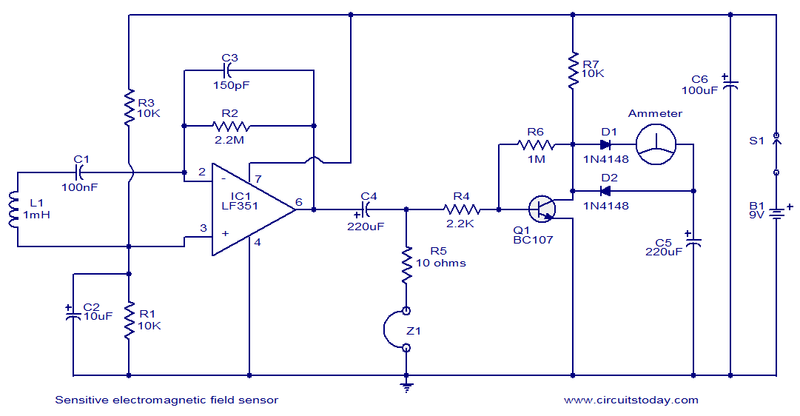 The low noise opamp LF351 and associated components forms the pick-up section. 1uH coil L1 is used for sensing the field and the IC1 performs the necessary amplification. If the picked electromagnetic field is in the audio frequency range, it can be heard through the head phone Z1.There is also a meter arrangement for accurate measuring of the signal strength. Transistor Q1 performs additional amplification on the picked signal in order to drive the meter. The circuit can be assembled on a Vero board. Use a 9V PP3 battery for powering the circuit. IC1 must be mounted on a holder. Z1 can be a common walkman head phone. Switch S1 is the ON/OFF switch. All electrolytic capacitors must be rated at least 10V. 5V power supply using 7805. Can I use mili volt meter insted of ammeter…and insted of walk man headphone we use mobile speaker…. OOps ! Almost forgot, L1-1mH This also comes in several flavors as well. Would Ferrit wound or the kind that looks like a resister be best suited for this application.? Also Does L1 need to be in the package or on the outside for best results.? It would be really cool to have some LED’s light up so that a number of these devices can be placed in different locations during a paranormal investigation. Ammeters come in several flavors such as Amps, mA, Some are 0-100 and some are 0-20. My question is which would be best suited for this application.? I reccomend smaller mA range, much more sensitive and uses less power than A range ammeter. I m a great fan of circuitstoday.com and highly impressed by their works but if the article consists more of an explanatory part of a circuit Diagram,it would be more helpful…..
A question about the cutoff frequencies. The lower cutoff frequency is 482Hz. But how to calculate the higher cutoff frequency? Thanks the link is useful with PCB and layout. sir please send the design of this circuit and the block diagram.